The keys to the development of children and their future livelihoods are adequate nutrition and education. These priorities are reflected in the first and second Millennium Development Goals. The reality facing millions of children, however, is that these goals are far from being met. Children who go to school hungry cannot learn well. They have decreased physical activity, diminished cognitive abilities, and reduced resistance to infections. Their school performance is often poor and they may drop out of school early. In the long term, chronic malnutrition decreases individual potential and has adverse affects on productivity, incomes and national development. Thus, a country’s future hinges on its children and youth. Investments in nutrition and in education are essential to break the cycle of poverty and malnutrition. FAO believes that schools can make an important contribution to countries’ efforts to overcome hunger and malnutrition, and that school gardens can help to improve the nutrition and education of children and their families in both rural and urban areas. In this regard, it is important to stress that school gardens are a platform for learning. They should not be regarded as bulk sources of food or income, but rather as a way to better nutrition and education. FAO encourages schools to create learning gardens of moderate size, which can be easily managed by students, teachers and parents, but which include a variety of nutritious vegetables and fruits, as well as occasionally some small-scale livestock such as chickens or rabbits. Production methods are kept simple so that they can be easily replicated by students and parents at their homes. Food systems are the unifying concept. “From plot to pot”, students learn how to grow, tend, harvest and prepare nutritious seasonal produce, in the educational settings of the classroom, the garden, the kitchen, the school cafeteria and the home. The experience promotes the environmental, social and physical well being of the school community and fosters a better understanding of how the natural world sustains us. Links with home gardens reinforce the concept and open the way for the exchange of knowledge and experience between the school and the community. Such food-based strategies have the merit of sustainability: they create long-term dietary habits and put food choices into the hands of the consumer. A strong education component ensures that the effects go beyond the immediate time and place, to children’s families and future families. Nutrition concerns also link the developed and the developing worlds, which share many dietary problems. For example, the need to change perceptions of fruits and vegetables and to learn how they are best grown, prepared and eaten is common to many communities, rich and poor, and may be critical in building community health in both. This makes for meaningful joint efforts and exchanges of experience, ideas and teaching materials. FAO has prepared this Manual to assist school teachers, parents and communities. 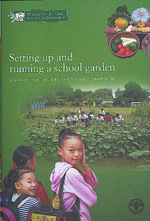 It draws on experiences and best practices of running school gardens all over the world. Classroom lessons are linked with practical learning in the garden about nature and the environment, food production and marketing, food processing and preparation and making healthy food choices.